Sunflower seeds. Research in Experimental Dermatology found people with acne typically have low levels of vitamin E and zinc – which heal the skin, and regulate oil production. And sunflower seeds have both nutrients. They also have loads of selenium – which helps reduce redness and inflammation. All you need is a handful a day to get enough vitamin E, and half your requirement of zinc. For the remaining zinc, try chicken, shellfish or beans. You may have heard that putting hand sanitizer on a pimple will get rid of the bacteria and dry it up? NOT TRUE! Dermatologists at Stony Brook University say putting hand sanitizer on acne will only make things worse. First, your skin will produce even more oil to compensate for the drying effect. And the active ingredients in the gel can irritate the skin on your face. As a result, you can get more pimples and redness as a rebound effect. So, don’t do it. Instead, use a product that’s made to fight pimples on your face that contains benzoyl peroxide. You may want to see a dermatologist! Here’s the scenario: You got a pimple, and instead of waiting for it to go away on its own, or treating it, you popped it. So, how long should it take the SCAR to heal? According to dermatologists at Harvard Medical School, most acne scars and spots should fully heal within TWO MONTHS. And any scar that hangs around longer than that should trigger a call to your dermatologist, ASAP. The reason? Because that spot you thought was acne may have been a cyst or ulcer linked to basal cell carcinoma – one of the most common forms of skin cancer! In fact, doctors say it’s very common for patients to mistake the early symptoms of skin cancer with acne or eczema. But as we always say: The earlier your doctor diagnoses skin cancer, the easier it is to treat. So, if you notice anything unusual on your skin – including an acne scar that won’t go away – get it checked out. According to dermatologist Dr. Adam Friedman, honey has antibacterial properties that help soothe chapped lips, and heal wounds. For best results, he says dampen your lips with lukewarm water, then apply a thin layer of honey. Once the water dries, apply a layer of petroleum jelly, and let the mixture sit for about 15 minutes before removing it with a moistened cotton swab. Do that once a day, and Dr. Friedman says your chapped lips should be healed in no time. Count the moles you see. If there are more than 11, you probably have more than 100 moles all over your body. And that means you’re 5 times more likely to develop melanoma – the deadliest form of skin cancer. If that’s the case, get a full body skin check annually by a dermatologist. So why the right arm? Because it’s not the one that hangs out the car window when you drive – so the skin spots are more likely to be moles – and less likely to be freckles from sun exposure. What’s a health symptom you should never ignore? A pimple! Yes, it could be an actual pimple… But it could also be basal-cell carcinoma, a slow-growing form of SKIN CANCER. So how can you tell the difference between a pimple and something more serious? If the pimple’s actually basal-cell carcinoma, it usually has a pearly appearance when light shines on it… And you can see tiny blood vessels around the base of the pimple. That’s according to Dr. Edward McClay – director of the San Diego Melanoma Research Center. 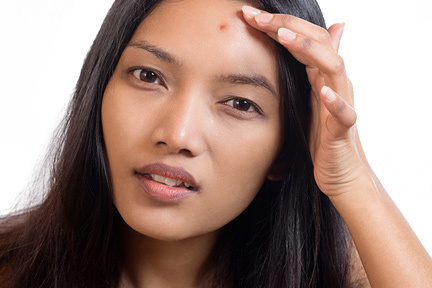 So if you have a pimple that looks suspicious or won’t go away – see your dermatologist. Basal-cell carcinoma is 95% treatable when caught early. According to the British Association of Dermatologists, an outbreak on your ears or cheeks could be caused by the nickel surface on your cell phone. It happens wherever the skin touches the cell phone for too long. Nickel is a common metal, and is found in everything from belt buckles to coins. It’s also one of the most common causes of skin allergies. To avoid this from happening, try using a corded headset.